Tender Shipyard – Superyachts News, Luxury Yachts, Charter & Yachts for Sale. 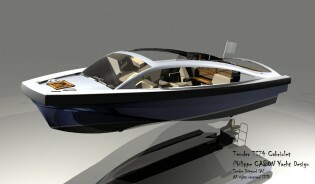 I am Philippe CABON, French Yacht designer and builder. Today, I am happy to inform you, I create a new shipyard specialised in the tender construction for motor yacht and sailling yacht call “TENDER Shipyard SAS”. We have signed a new tender 7,4 meters for the Baglietto motor Yacht 53 meters. Please find in attachment somes pics of this tender. This tender is build all in carbon fiber and epoxy resin, prepreg for the hull and infusion for the deck. With the experience of the good hull shape of the last tenders, I design a new hull shape more comfortable, more large and light. This new design is sudy specialy for the tender garage dimensions. We can lift the boat with one or two points. We have a peripheric removable fender build in foarm close cel, wrapp in a strong tissus. 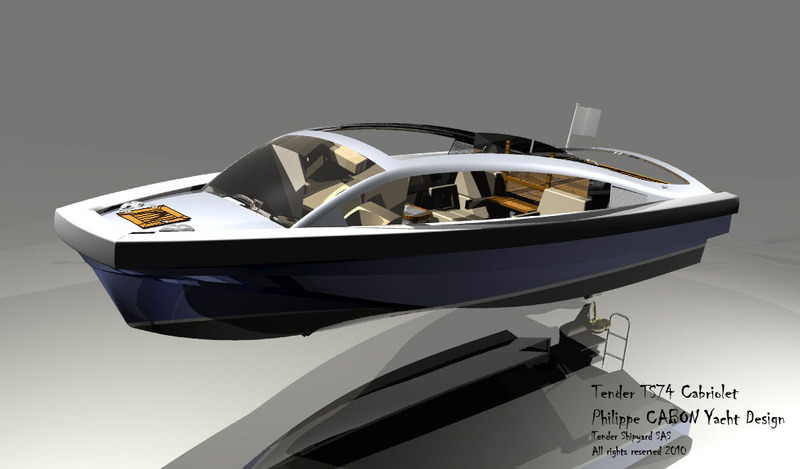 This tender is equiped with a removable hydraulic hard top for the VIP space. In standard, we have GPS, VHF, radio, swimming ladder, removable cushion, hull and deck color on choise, teck, etc. We delivery this tender at the end of January 2011, and if you are interested, we can do a test in mediterrannee or in Vendée at Les Sables d’Olonne. We are also in discussion with somes owners and captains for a limousine tender 7.4 meters for 8/10 passangers and 2 crews and a cabriolet tender for 6 guests and 2 crew. We have a range of tender betwen 3.4 meters to 12.5 meters long and I can study and design all kind and size of tenders. If you want more informations, don’t hesited to contact me. Superyacht Tenders and Toys announces the launch of new company Shipyard Supply Co.